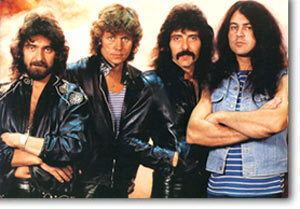 Ian Gillan's decision to fold his band Gillan had a fair bit to do with preparing himself for a reformed Deep Purple. There's no doubt that Ian's voice had suffered in his Gillan days due to a gruelling tour schedule - with his trademark piercing scream often replaced by a throaty roar. However, negotiations broke down (at least temporarily), and Ian instead spent a year in a surprise new line-up of Black Sabbath. The decision to join was taken over a pint or ten with Tony Iommi and Geezer Butler, who were casting around for a replacement for the recently departed Ronnie James Dio. With original drummer Bill Ward (temporarily) back on board, the band went back to their roots and came up with the pointedly named 'Born Again', which turned out to be a tour de force for Gillan, containing some excellent material which was (not for the first or last time in Ian's career) spoiled by a muddy mix. Never the most popular career move with fans of Black Sabbath or Ian Gillan, the band's only UK show (at the 1983 Reading Festival - aired by the BBC) left opinion polarised. Unlike Ronnie James Dio, who was able to bring his own identity to the band, Gillan seemed to be used more as an Ozzy substitute, and seemed uneasy handling the Osbourne era material, often struggling to remember the lyrics. Nevertheless, despite a lack of critical acclaim, and Bill Ward having to be replaced on the road by the ELO's Bev Bevan, the band still toured North America from October 1983 to March 1984 on a scale Ian had not seen since his Deep Purple days, excellent preparation for what was to come when the reunited Deep Purple Mk2 toured the same territory in 1985. By the time the Deep Purple reunion was announced in April 1984, Ian had already handed in his notice with Black Sabbath, all concerned being in agreement that the union had not really worked out. However, the studio album, especially if it received a sympathetic remix, could still hold its own within the Gillan and Black Sabbath catalogues. The Purple / Sabbath connections were reactivated when Tony Iommi recruited Glenn Hughes into the band just over a year later. Promos for 'Zero The Hero' and 'Trashed' were included on VHS compilation 'Metal Edge' (Screen Gems, UK, 1984). Clips from the promos were included on the 'Black Sabbath Story Vol 2' documentary video, since hastily transferred to DVD (see cover left). It also includes interview material with Ian Gillan.